Colombian Army on manoeuvres during the conflict. Resolved by the League of Nations, which upheld the Salomón–Lozano Treaty, and the Rio de Janeiro Protocol signed by Colombia and Peru which reinstated the status quo ante bellum. The Leticia Incident, also called the Leticia War or the Colombia–Peru War (1 September 1932 – 24 May 1933), was a short-lived armed conflict between Colombia and Peru over territory in the Amazon rainforest. At the end, they reached an agreement for Colombia to stay with a part and Peru with another part. The Colombia–Peru War of 1932-3 was the result of dissatisfaction with the Salomón-Lozano Treaty and the imposition of heavy tariffs on sugar. The war started with an internal insurrection in Peru, a civilian takeover of the city Iquitos. On the 1 September 1932 President Luis Miguel Sánchez dispatched two regiments of the Peruvian Army to Leticia and Tarapacá, both settlements located in the Amazonas Department in present-day southern Colombia. These actions were mostly ignored by the Colombian Government at the time. It was not until the 17 September of that same year that the Colombian Government took notice. The Peruvian Military Forces which were encroached upon the banks of the Putumayo River stopped several large trade ships from traveling to Leticia. The result of this was an explosion of Colombian patriotism. Laureano Gómez head of the Senate minority proclaimed, "Peace, peace, peace in inner Colombia; War, war, war on the border against our despicable enemy." On the 19 September El Tiempo reported that they had received over 10,000 letters calling for war and control of Leticia. That same day thousands of Colombian students marched through the streets of Bogotá chanting, "Sánchez Cerro will die and Colombia will defy!" Vásquez Cobo was declared general of the Colombian Amazonian Navy and 10 million dollars were approved by the Senate to fund his venture. Over 400 kilos of gold were donated by the Colombian cities as a symbol of gratitude to Huilan engineer, César García Álvarez. War Memorial in Tarapacá, Colombia. Plaque reads,"To the Heroes of the Colombian Air Force; who with true courage gave the best of themselves; flying with their noble aircraft over river and jungle. Declaring over our Amazonia with the sound of their motors the sovereignty of our country during the war with Peru." President Sánchez believed Colombia had no chance of defending itself: lacking roads and a proper Navy, the Amazon region had no Colombian military presence. It was not until December 1932 that General Alfredo Vásquez Cobo reached the mouth of the Amazon River with a fleet of old ships he acquired in Europe. Within 90 days Colombia organised a respectable military response to the Peruvian invasion. Herbert Boy and the other German Aviators of SCADTA (later to become Avianca) fitted their commercial planes for war as a temporary Colombian Air Force. The first attack by the Colombian Navy was upon Tarapacá. The city had been chosen because Leticia was on the border with Brazil and the Colombian Forces preferred to attack a softer target rather than the well-defended Peruvian positions in and around the city. The recuperation of Tarapacá was a bloodless event since no Peruvian troops were present in that town. The day before, on the 14 February 1933, the Peruvian Air Force had attempted to bomb the Colombian Fleet, but most of the bombs had missed their targets. The Peruvian forces in Leticia could not be forced to withdraw but the events in Lima, and the assassination of the Peruvian president, changed the situation and the new Peruvian president ordered undefeated Peruvian troops to leave Leticia. Part of Peru's Pacific fleet were coming through the Amazon River to engage in combat. On the same day, the Colombian president Enrique Olaya broke off all relations with the Peruvian government due to the aerial attack. He ordered an attack on Leticia but it was repelled by Peruvian troops. On the 30 April 1933, President Sánchez was shot dead. 15 days later, his successor, Óscar Benavides, met with the head of the Colombian Liberal Party, Alfonso López Pumarejo, to secure an agreement to turn Leticia over to a League of Nations commission. Colombia and Peru met in Rio de Janeiro, Brazil to sign a peace treaty. In the Rio de Janeiro Protocol, Peru stated that, "We sincerely deplore the events that occurred starting September, 1932. Specifically those that damaged our relationship with Colombia." The Salomón-Lozano Treaty was also reaffirmed by the treaty. von Rauch, Herbert. "A South American Air War...The Letcia Conflict." Air Enthusiast. Issue 26, December 1984-March 1985. Bromley, Kent: Pilot Press. Pages 1–8. ISSN 0143-5450. 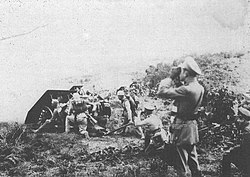 Wikimedia Commons has media related to Colombia-Peru War. This page was last edited on 11 February 2019, at 14:14 (UTC).